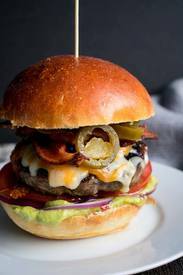 The key to a good juicy burger is to get quality meat, and to make sure the fat content is higher and to not use lean ground meats, especially if it is for a beef burger. You want higher fat because that is where the juice and flavor is. I also highly recommend either going to a local butcher or going to a community market that sells locally raised meat.